(a) Standard Paper Copy. 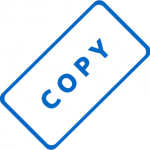 The charge for standard paper copies reproduced by means of an office machine copier or a computer printer is $.10 per page or part of a page. Each side that has recorded information is considered a page. Specialty paper (e.g. : Mylar, blueprint, blueline, map, photographic-Actual cost. (a) The charge for labor costs incurred in processing a request for public information is $15.00 an hour. The labor charge includes the actual time to locate, compile, manipulate data, and reproduce the requested information. (b) A labor charge shall not be billed in connection with complying with requests that are for 50 or fewer pages of paper records, unless the documents to be copied are located in: (i) two or more separate buildings that are not physically connected with each other; or (ii) a remote storage facility. (c) When confidential information is mixed with non-confidential information on the same page, a labor charge may be recovered for time spent to redact, blackout, or otherwise obscure confidential information in order to release the non-confidential information. A labor charge shall not be made for redacting confidential information for requests of 50 or fewer pages, unless the documents to be copied are located in (i) two or more separate buildings that are not physically connected with each other; or (ii) a remote storage facility. (a) Whenever any labor charge is applicable to a request, the Association may include in the charges direct and indirect costs, in addition to the specific labor charge. This overhead charge would cover such costs as depreciation of capital assets, rent, maintenance and repair, utilities, and administrative overhead. If the Association chooses to recover such costs, a charge shall be made in accordance with the methodology described in paragraph (c) of this subsection. (b) An overhead charge shall not be made for requests for copies of 50 or fewer pages of standard paper records unless the request also qualifies for a labor charge. (c) The overhead charge shall be computed at 20% of the charge made to cover any labor costs associated with a particular request. For example, if one hour of labor is used for a particular request, the formula would be as follows: Labor charge for locating, compiling, and reproducing = $15.00 x .20 = $3.00 overhead charge. Remote Document Retrieval Charge. To the extent that the retrieval of documents results in a charge to comply with a request, it is permissible to recover costs of such services for requests that qualify for labor charges. Postal and Shipping Charges. The Association may recover any related postal or shipping expenses which are necessary to transmit the reproduced information to the requesting party. Miscellaneous Supplies. The actual cost of miscellaneous supplies, such as labels, boxes, and other supplies used to produce the requested information, may be added to the total charge for information. B. Any requesting owner must provide advance payment of the costs of compilation, production, and reproduction for the requested information, as estimated by the Association. If the estimated costs are lesser or greater than the actual costs, the Association shall submit a final invoice to the owner on or before the 30th business day after the date the information is delivered. If the final invoice includes additional amounts due from the owner, the additional amounts, if not reimbursed to the Association before the 30th business day after the date the invoice is sent to the owner, may be added to the owner’s account as an assessment. If the estimated costs exceed the final invoice amount, the owner is entitled to a refund, and the refund shall be issued to the owner not later than the 30th business day after the date the invoice is sent to the owner. C. Except as provided by D. below and to the extent the information is provided in the meeting minutes, the property owners’ association is not required to release or allow inspection of any books or records that identify the dedicatory instrument violation history of an individual owner of an association, an owner’s personal financial information, including records of payment or nonpayment of amounts due the association, an owner’s contact information, other than the owner’s address, or information related to an employee of the association, including personnel files. Information may be released in an aggregate or summary manner that would not identify an individual property owner. These Charges are subject to periodic revaluation and update so that they remain consistent with that provided in 1 T.A.C. Section 70.3. This policy shall supersede and render null and void any previously adopted policy to the extent that the terms of such policy are contradictory. Policies are "dedicatory instruments," which means that they must be recorded in the property records of Rockwall County.